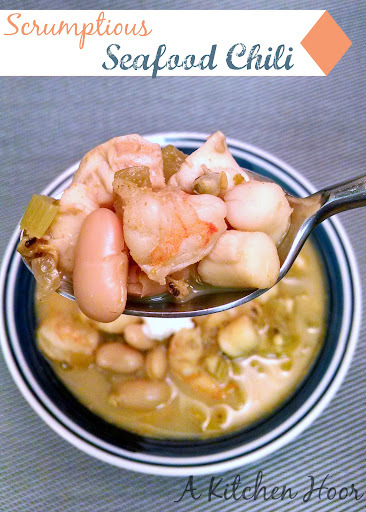 Shrimp, scallops, and fish swim in a vegetable, green chile, and cumin based chili with cannelini beans. Seafood Chili is definitely one your guests will not expect. 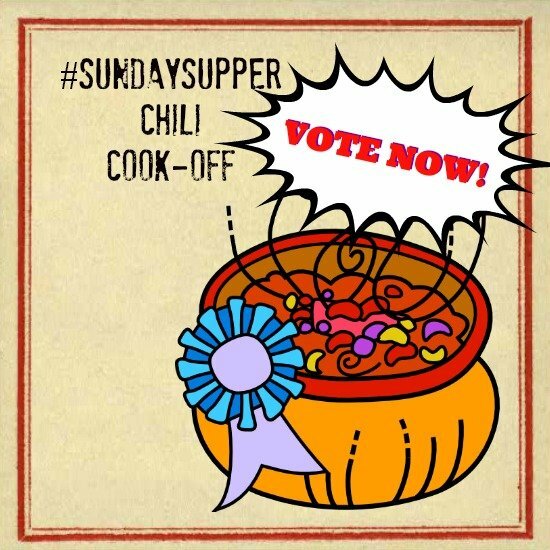 This week, #SundaySupper is doing a chili cook off! There is some pretty tough competition. Scroll down to the bottom to check out the other competitors. Not now!! Finish my post and check out my recipe first! Sheesh!! There’s a TON of recipes out there. Beef, ground or chopped. Chicken, turkey, meatless, vegetarian with lentils, vegetarian with tofu or seitan, shrimp, you name it. There are endless possibilities out there on the internet. There are very few seafood chili recipes. I don’t know why. Seafood chili is SUPER tasty. Just look at all that tasty goodness in there!! There’s cannelini beans, scallops, shrimp, clams, fish, onions, celery, garlic, and spices. All these ingredients are swimming in a tasty, clam juice and vegetable broth. I know what you’re saying. “How in the world can that be chili?” But it is! It tastes like chili! The spices are key. Cumin, of course. I LOVE cumin. I’d put it on everything if S loved it as much as I did, but he doesn’t. There’s some chili powder, but not too much. There’s a little bit of heat in the ground chipotle powder. Yeah. That’s stuff’s delicious! It’s a bit of heat with added smoke. It enhances the smoky flavor of the cumin which seals the deal that this is chili. Seriously. It’s chili. The only way to convince you, I guess, is to have you make it for yourself! NOW you may scroll past my recipe and check out the other competitors in this #SundaySupper Chili Cook Off. There's a TON of recipes out there. Beef, ground or chopped. Chicken, turkey, meatless, vegetarian with lentils, vegetarian with tofu or seitan, shrimp, you name it. There are endless possibilities out there on the internet. There are very few seafood chili recipes. I don't know why. Seafood chili is SUPER tasty. I never would have thought of using seafood in my chili! What a gorgeous idea! I never even though of adding seafood. I was so intrigued to check out this recipe, as I've never heard of a seafood chili before! So cool – and the combo of flavors and textures definitely seems awesome. I have never heard of seafood chili, but this is seriously calling my name! I have never had a seafood chili before. You make it look so easy and delicious. I have to give this a try! Very creative! I had never heard of a seafood chili before, and I would LOVE to try it! It looks so tasty!!! So creative – would have never thought of this but it looks wonderful! So intrigued by the idea of a seafood chili! Wow! Thats' a lot of seafood! It sounds like a delicious and unusual chili! Seafood chili? My daughter would love this! I have never had seafood chili before, what a scrumptious idea!! Amazing chili for sure! So glad you made a seafood one for our cook-off today. Love it. Never heard of seafood chili but I like the way yours looks! I am SO glad someone made a seafood chili! And you hit this one out of the ballpark! Delish! Seafood chili! This is one crazy chili and I love it! I would have never dreamed of seafood chili! I love it!! I toyed with the idea of making a seafood chili for this cook off but in the end had a change of mind. But I am so glad you made one, this looks so good I need to make it for us. One of my Facebook fans said a seafood chili was her favorite. I gave her your recipe! Yum! I'm a pescatarian, so this chili is SO right up my alley. Love that you went way out of the box and are the only one with a seafood chili!